Home > Bangalore > ENT Specialists > Koramangala > Dr. Vijayalakshmi.M. 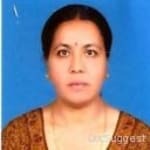 Dr. Vijayalakshmi.M. is an experienced ENT Specialist in Koramangala, Bangalore. She has over 26 years of experience as a ENT Specialist. She is a qualified MBBS, Diploma in Otorhinolaryngology (DLO), DNB (ENT) . She is currently practising at Apollo Clinic in Koramangala, Bangalore. Book an appointment online with Dr. Vijayalakshmi.M. on Lybrate.com. Lybrate.com has a number of highly qualified ENT Specialists in India. You will find ENT Specialists with more than 25 years of experience on Lybrate.com. You can find ENT Specialists online in Bangalore and from across India. View the profile of medical specialists and their reviews from other patients to make an informed decision. Book Clinic Appointment with Dr. Vijayalakshmi.M. Submit a review for Dr. Vijayalakshmi.M. I have a sore throat and I'm having trouble swallowing any sort of solid eatables. Can anyone suggest a quick way to treat this? I am 23 years old 4th year btech student. I am having little dizziness while I am standing still or not working. Sometimes I also have heavy head. It is happening from last two months, I firstly consulted with general physician who told me for neck xray which was normal and prescribed me with medicine for vertigo for 10 days. During that course I got diagnosed with malaria and typhoid and other doctor said that dizziness might be due to malaria so I carried on with medication for same. It has been more than 15 days completing the course for typhoid and malaria but my dizziness has not gone. I get my sleep well, no nausea. I am little health phobic and want to get fit and study well. Kindly give guidance for which specialist doctor should I go? Please check Hb & vitamin B12 levels. And take proper doses, if needed. Anxiety, cervical spondylosis, meneriere diseases are some common causes that can cause this. Homeopathy can help in above issues. I usually get tonsils and sore throat. Later I developed cold and cough it usually happens whenever I eat something from outside. How to prevent it and treatment for same. Greetings lybrate-user, there could be multiple reasons as to why the recurrence is happening. A) low immunity secondary to anemia b) infection- either bacterial viral or infectious mononucleosis (all of which present with a more or less similar set of symptoms that you are suffering with. Advice - avoid street food, use sanitizer as much as possible and don't take chances with water. Second if you are already careful about the stuff I mentioned above then you may have to go ahead and investigate the problem. Step 1 - get a throat swab done for culture and sensitivity 2- test for infectious mononucleosis 3 cbp (complete blood test) based on reports you may have to start antibiotics or you may also have to undergo tonsillectomy. If you have more than 6 attacks of sore throat and enlarged tonsils or if you had 3 attacks per year for the past 3 years then you must undergo tonsillectomy. Hope this helps. Thanks. I am feeling breathlessness all the time specially after exercise and after eating food what is tha reason for this. Felling something choking in my throat pla suzzest tablet or diet. Reduce your weight Blood Sugar Check Thyroid profile check 1200 cal diet in consultation with Dietician 5 km walk daily. I have red eyes red nose, swelling in the throat, and this problem is troubling me since last 3 days so I want to ask you can you help. Hi the description of your condition suggests that you are having an infection. Redness of the eyes can also be because of throat infection. You can take tablet azee 500 mg, one tablet once a day for three days and report after 3 days. I have problem of nose bleeding from last 5 years and took a treatment homeopathy and I get obese when I leaved that medicine and recently it is getting worse and frequently i am suffering nose bleeding and I had sinus also so what is the solution for this problem doctor please tell me immediately and a diet for obesity and i am also a vegan. Do saline gargles daily. Whenever possible do steam inhalation also. Cover your nose and mouth with hanky for at least 30 sec when you go in dusty areas also when you go in and out of AC. As our nose is the most sensitive part of our body, When there is temperature difference between two rooms or inside n outside, then if we not protect our nose, it gets affected. Homeopathic treatment has very encouraging results and gives relief in long term please ask for consultation with detailed information so that I can help you better. Sir my younger brother aged 15 yrs, have gone to the tonsil operation 4 years before, but till now he is suffering from small ulcer in his throat ,these ulcer comes in every 2 months and disappear itself within 15 days please tell me some home remedies and reason for this and also the control measures. Do betadine antiseptic gargles. Keep mouth clean. Rinse After every meal. Take becosul I capsule daily for 15 days. Hi, I am 24 years old I having throat right side pain, feel some discomfort while eating vomiting feeling while taking food throwing up, taking small amount of food also stomach fullness and daily feeling body heat and stomach burn various places after eat, feeling fever regular can you please suggest me the medicines. Please get lft, tsh and usg whole abdomen done. Do not eat chillies in any form, drink plenty of water, eat small frequent meals. What should I do to remove of ear wax. Because of using Johnson ear bud it has gone back in ear canal. I am feeling as my ear has blocked and hearing less also. plz madam you can be used hair remover cream. but be carefully. just use cream with ear bud then after 15 minits other dry cotton. then use toner with ear bud just like dry. don't use extreme inner point. My left ear sounds HISS or SAI-SAI. Reflex action also gets slow. Hard to memories or recalling. What is this best solution? Please advice. First checkout to there is tympanic problem or not if membrane no issue then consult for homeopathic treatment. It is good result for you.